This subject is weighing very heavy on my heart this morning and I feel compelled to write about it. I know I'm not going to gain any friends by posting this blog because some people are very touchy about this subject. A lot of people probably won't even read this blog, and the ones that do may become defensive and angry. But that's okay, because I feel like it is my duty as a vegan to educate others and express my own thoughts and feelings on various subjects. Shortly before going to bed last night, I saw a photo on Instagram that just made my heart sink. The photo I saw was of a girl,who's my age, and she was posing with an antelope that she had just killed. 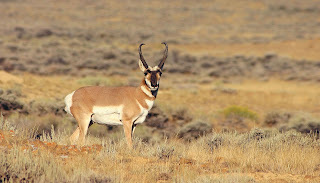 She was holding up a rifle with a scope in her left hand, and was holding up the neck of the antelope in her right hand. The caption read "I guess you could say I've got aim." I scrolled through the few comments and was saddened to read one that said "I'm so proud of you!!!!!." Yes, that's how many exclamation points were used. I'm not calling this girl out to point fingers and make her feel guilty, because I can assure you she doesn't. I'm just showing a real life example of hunting in this country. A teenager, one my age, who willingly shot and killed a creature. The sadder thing is kids far younger than sixteen and seventeen kill animals just like this. Why? Long before I ever went vegan I largely disliked hunting. The thought that someone could go into a creature's habitat and stalk, ambush, and kill them made me sad and sickened. Even more so when they posed with the poor creature and hung their head up on a wall as if to say, "Yeah. That's right. I just killed you. I'm bigger and stronger than you and I made a good shot." I just didn't understand. I believe that some people think that they're doing the right thing by hunting. They're helping to control the population. But then I believe that some people genuinely take delight in killing an innocent creature and for those people there's probably nothing I can do to change their minds. But for those who don't know about hunting, I'll provide you with some information. Hunting does not conserve a species population, but actually leads to overpopulation. Hunters go into a species habitat and disrupt the natural cycle and order of species. Populations have a way of controlling themselves with the strong preying on the weak. However, hunters mess with this natural cycle by killing off the biggest, strongest, and fittest animals they can find. It's not just deer that hunters kill, they also kill other animals that prey on deer like bears, wolves, and coyotes. If these animals are taken out the ecosystem then there tends to be an increase in the population of certain animals, like deer. Ecosystems have been taking care of themselves for millions of years and the human population has no justifiable right to go into them and disrupt them. Hunting is not a sport because usually in a sport you have two willing parties who are participating in a game where they are adhering to rules set by a referee, where the goal is to achieve the highest score. Hunting is not a sport because there is only one willing participant: the hunter. Hunters most likely never give thought to what they're killing. To them it's just a deer, bear, duck, coyote, etc. Do they ever dwell on the thought that they just killed a mother, father, son, or daughter? These animals that are hunted have families and lives. They have a home that we come and tramp into to take away their life. No animal wakes up on the day they're going to be killed and thinks "I wonder if I'm going to be shot today" because hunting is a surprise and complete shock to the animal. Hunters come into a habitat to wait, stalk, ambush, and ultimately kill their prey. The animals get no warning, no sign that something is coming. They only briefly hear the sound of the gun and then boom. They fall to the ground. Sometimes they won't even hear a sound, because they won't be shot, but impaled instead by a bow and arrow. What if they hunter misses the mark and doesn't strike the heart? Will the animal suffer in pain? For many families hunting is the norm. My father did it, his father did it, I did it, and now I'm teaching you to do it. What message are we sending to our children when we demonstrate to them that it's okay to kill another creature? How are we teaching our children respect, and compassion, when we go tramping into an animal's habitat and wipe them off the face of the earth. There are plenty of other ways to have bonding experiences with your children. Build a tree house, build something they can use like a tool box, play a REAL sport with them like golf, football, or Frisbee. Hunting is not necessary and it's a sad "sport." Would that woman who commented on the girl's picture have said "I'm so proud of you!!!!!" if the girl had killed a person? Of course not, she would have been horrified, upset, saddened, confused, and probably angry. But because this animal had four legs and couldn't talk, what she did was totally justifiable and acceptable. "Hunters kill more than 200 million animals yearly"
"The delicate balance of ecosystems ensures their survival—if they are left unaltered." Deere, ducks, bears, wolfs, coyotes, elk, birds, squirrels, turkeys, and any other animals that are hunted for recreation, deserve the right to live their lives on this planet that we share with them.